Have worked with Filta and their crew for 2 seasons now, and they were here one season before that. Don’t know what we would have done with the fryers as we had a managed kitchen before we took over concessions. These guys are great! They designed a program for us and watch out for us when we have super large crowds, they just seem to know when we need them, or just one call to Filta and everything gets taken care of. WHAT A SERVICE, don’t know what we did before they got here. 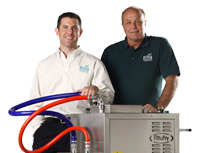 Filta Franchise Owners and Technicians provide service to hundreds of Stadiums.